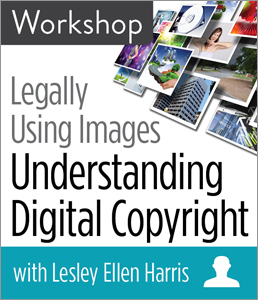 CHICAGO—ALA Publishing eLearning Solutions announces an exciting new workshop, Legally Using Images: Understanding Digital Copyright with Lesley Ellen Harris. This workshop will last 90 minutes and take place at 1:30pm Eastern/12:30 pm Central/11:30 am Mountain/10:30am Pacific on Wednesday, Nov. 29, 2017. In the digital age, we face a new series of challenges when it comes to copyright. The web gives us access to a staggering number of images that we can use on our web pages, in our digital content, our library signage, and in presentations. You can search google and come up with thousands of images to represent anything—but how do we know what restrictions copyright law places on our ability? How can we create practices for image usage that ensures we do it legally and effectively? In this workshop, copyright expert and lawyer Lesley Ellen Harris debunks common misinformation about using images and teaches you strategies so you can determine which images require copyright permission and which you can safely use for free. Harris also alerts you to hidden traps in licensing language. She reviews the essentials of relevant copyright law and teaches you how to avoid expensive and time-consuming legal hassles when using third-party content. This workshop will help increase your confidence in your ability to use images in a copyright-compliant way and lower your risks of copyright infringement. Lesley Ellen Harris , JD, is a copyright consultant, published author, copyright blogger, and educator. Her areas of concentration include U.S. and Canadian copyright law, international copyright law, and licensing digital content. Lesley frequently works with libraries, archives, museums, and educational institutions. She teaches in-person and online courses on copyright and licensing, including the Copyright Leadership Certificate program, through Copyrightlaws.com in conjunction with national and regional associations. Lesley is the author of numerous articles and several books including the upcoming Licensing Digital Content: A Practical Guide for Librarians, Third Edition (ALA Editions). She maintains the website Copyrightlaws.com. Registration for this ALA Publishing eLearning Solutions Workshop is available on the ALA Store. You can purchase registration at both individual and group rates. ALA Publishing eLearning Solutions Workshops offer a convenient, hands-on learning experience that will help you and your colleagues make the best decisions for your library. This workshop is licensed for use by staff or users of the purchasing institution or library organization. ALA Publishing eLearning Solutions (ELS) produces high-quality professional development events and materials for the library profession. ELS events cover modern issues on a wide variety of topics in formats that include live workshops, asynchronous eCourses, and print publications. We help ensure that today’s library employees have access to the professional development opportunities they need, whether they are brushing up on the basics or expanding their horizons with cutting-edge tools. Contact us at elsmarketing@ala.org. ALA Store purchases fund advocacy, awareness, and accreditation programs for library professionals worldwide.